Review: Sally Rand | Oh, The Glamourous Life! 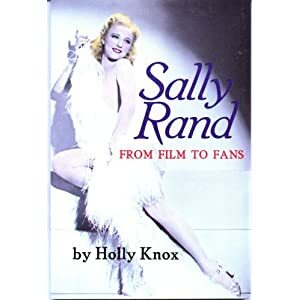 Sally Rand: From Film to Fans by Holly Knox (1988). In 1932 Sally Rand auditioned for The Paramount Club in Chicago and her life changed. With mere hours to put together an act, she bought two large feathered fans at a second-hand store and hastily began making a Grecian-style gown. She planned to dance to a record of harp music. Her gown wasn’t ready in time for curtain and all the music was provided by a piano player. She asked him to play Debussy’s “Claire de Lune” and went on stage with nothing but her fans to cover her. It was 8 minutes of magic. And she continued to perform that same act for almost 50 years. As for what occurred before that night and after, I leave that to the book to tell. The author, Holly Knox, performed in Sally’s show in the 1950’s. She profiles a dedicated performer, a producer, a mother, a religious woman who swore like a trucker. Miss Rand was both generous and tight-fisted. She created two etherial acts — the fan dance and the bubble dance — but never shied away from getting her hands dirty. There’s a photo of her up on a ladder, assembling her own sets. A number of b&w photographs of varying quality. No bibliography or notes. As far as I can tell, the only book on Sally Rand. You can (and should) buy it directly from the author via Amazon. She sends it inscribed “Have a fan-tastic read”. If you’re going to be sorry to see my book reviews come to end, there are still a few burlesque books I have my eye on right here on my wishlist.